Valencia has owned and operated Angel Light Books and Gifts since 1989. An avid metaphysician, she has studied in depth topics including astrology, tarot, crystals and feng shui. She received her certification in astrology in 1987 from Experience Astrology in San Francisco and for Feng Shui in 1996 from Feng Shui Design in Grass Valley. Being Chinese, feng shui has always been an integral part of her culture. Her knowledge of crystals includes attending workshops from various teachers, studying from an extensive library of books and most of all from her personal experience of selling and giving away thousands of stones over the years. “I’m always amazed at how the perfect stone will find its way to the person who would most benefit from its power." She is also the author and creator of the Crystal Wisdom Cards now available on our online store. ​Valencia teaches How to Read the Rider Waite Tarot Cards, Astrology 101, Feng Shui 101, Crystal Awareness, Stones Awareness, and Chakra Awareness. Diana Dorell is a third-generation healer, certified Angel Therapy Practitioner with Doreen Virtue, numerologist, Reiki Master and former radio host on SoulsJourneyRadio and BlogTalk Radio. Diana helps powerful women feel confident and magnetic in their relationships, starting with themselves! She is the founder of the Angel Reiki Renewal Institute and certification programs. She has led workshops on how to trust your intuition all over the US and was recently a speaker at the State of Now #140conf in New York City along with Deepak Chopra, Ann Curry and others. Ryan Eriksmoen is a Nutritionist, Herbalist, Aromatherapist, Acupressurist, Angel Therapy Practitioner certified by Doreen Virtue and Clairvoyant. She underwent two years of formal education in Ayurvedic Medicine and completed 500 hours of training as an Acupressurist. She achieved certification in Aromatherapy and distills her own essential oils. Ryan earned her BA in Comparative Religion and Women’s Studies, and upon graduation served as a Unitarian Universalist Youth Minister. She is a Spiritual Counselor having completed the Clairvoyant Program with the Church of Divine Man and is currently undergoing training as an Interfaith Minister. Since early childhood, Ryan has been able to see, hear, and feel energy. She simply calls it “having extra senses or being able to sense spirit,” and brings these natural skills to her psychic readings. Ryan teaches classes on communicating with the angels, developing your psychic abilities and the energy anatomy. Philip has been studying and working with the Angelic Realms for over 10 years having over 10,000 hours of experience and expertise in connecting with Light beings and Realms. He has studied extensively with Drunvalo Melchizedek, Dr. John Demartini, Michael Simonson, Dr. Sarah Larsen, Dr. Ron Holman and Doreen Virtue. Philip is inspired to share from his Heart the vision and message directly from the Archangels and Angels of light. Philip is a master at leading people through guided meditations and creating a sacred, harmonious space. Khadijah is a healer, counselor, and spiritual teacher. She comes from a long ancestral history of women healers and has been practicing metaphysics since childhood. In addition, Khadijah Grant is the author of a forthcoming book Affirmations for the Spiritual Journey. She holds a B.A. in Humanities and M.A. in Counseling Psychology. Khadijah is a warm, entertaining, and a inspiring speaker. She has assisted many people with spiritual healing in her work. Khadijah teaches the Sacred Circle of Isis Course. Eloise is a nurse, psychic, and writer who has been in love with the Tarot since she picked up her first Rider-Waite deck at the age of eighteen. She worked in acute care nursing for thirteen years before deciding to pursue a career in writing and all things intuitive. She is the author of the Eileen McGrath Tarot mystery series and has over 30 years experience as a clairvoyant, clairsentient, clairaudient. In addition to doing private intuitive/Tarot/Rune readings, she hosts the monthly Psychic Tarot Faire at Angel Light Books & Gifts, particpates in the monthly Metaphysical Faire. Eloise teaches classes in the Aleister Crowley Thoth Tarot, Reading the Lenormand Cards, Wicca 101, Tea Leaf Reading, Runecasting, Palmistry, Astral Travel, Love and Money Magic. Monica is a Certified Reiki Master and her Education includes Master of English Literature, Early Childhood Development and Training in ‘Teaching Parenting the Positive Discipline Way’. Learning is an ongoing process for her. She has been practicing Reiki for more than 10 years and works with children and young adults with Autism, Individuals with chronic pains, emotional stress and depression. She has worked as a Behavioral Therapist for Children with Autism. She is currently tutoring children with ADHD and Asperger's Syndrome. Evelyn is an advocate for spiritual development, earth magic, & self love. 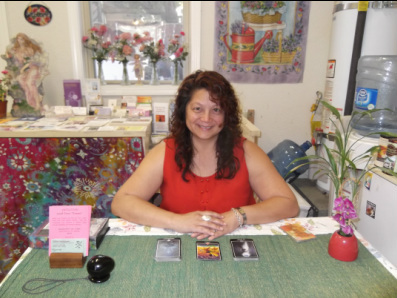 As a practicing psychic medium, psychometry reader, healer, angel card reader, she conducts classes every 3rd Saturday of the month at Angel Light Bookstore. She offers mini psychic/past life readings on the 1st Saturday of the month as well as private readings. She has helped many people connect with their higher consciousness. Evelyn teaches the Fairy Magic Class, Animal Totem Class, and the Mediumship Course. 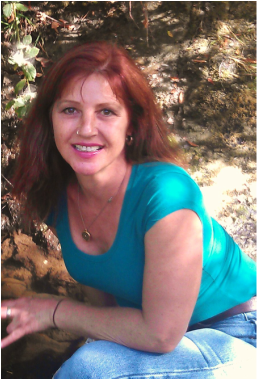 Helena is an artist, a gardener, and a clairvoyant who has been doing readings, healings, and teaching for many years. Her training at the Berkeley Psychic Institute includes the two-year intensive Clairvoyant Training Program, as well as graduate programs, including a Ministers program. She has done hundreds of readings since then and developed an advanced readers/healers group called the "Sunday Group," which has met weekly for over 8 years and continues in it's growth and professionalism. She been reading auras at the Whole Life Expo for 6 years and participating in many reading fairs including the Metaphysical Fair and the Angel Fair, which she hosts. The Angel Fair puts out a delightful newsletter! She has taught Goddess Workshops, Emotive Movement Workshops, Tarot, Ascension and the 7 Rays, Violet Flame, Chakra Healing, Working with the Archangels, Your Psychic Toolbox, Manifesting and Miracles and the beginning and advanced Meditation Circle/ Psychic Skills classes. Many of these are also teleclasses and podcasts as well. Her style is light and joyous, even funny sometimes, yet deep with powerful results. Cinthia is an energetic reader, channel for consciousness, intuitive graphologist and coach. She uses psychic, intuition, energy and creativity to reach into a person's past and find what is reducing a joyful present. Choices are then presented to either release these links or learn optimally before moving on. Readings, classes and coaching help align thought, emotion and action and bridges the gap between spirituality and physicality. Cinthia's readings, classes and coaching have depth, compassion and humor--making work feel light. Cinthia teaches classes on intuition including Intuitive Handwriting, Intuitive Decluttering, Intuition101, Psychometry, Shortcut Tarot, Guidance from your Spirit Guides and the Vision Board Class. She also teaches a 3 week Dreamwork Course.